I don’t know you yet. That’s totally fine. I write you letters sometimes. How creepy is that? Don’t answer that…. rhetorical question. Look at this bowl of shrimp and grits. Your mouth is probably watering. That’s normal. Here’s what I’d like to do, Future Husband. 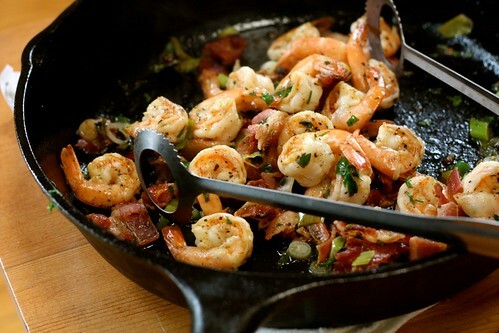 I’d like to make you a giant bowl of shrimp and grits. I’d like for you to come home from work, sit in front of the television and watch ESPN… I’m assuming you like that sort of thing. I’ll be in standing in the kitchen eating the other half of the shrimp and grits directly from the pan while reading Martha Stewart magazine. I like that sort of thing. A lot. Wait… is it weird that we wouldn’t share this meal at a table together? No… right? You understand that I sometimes like to share a meal with Martha Stewart magazine. I understand that dinner with ESPN is equally important. I’ll even bring you a beer if you call out for one. I hope we have corny beer cozies from the 80’s in our house. I hope we’re cool like that. Here’s to future marital teamwork. High five. Please don’t make me do a lot of work here. This dish shouldn’t require any convincing at all. Grits are stone ground hominy (soaked and dried corn)… very similar to polenta. 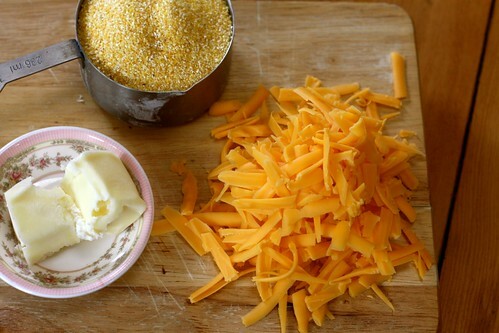 These grits are cooked up to a medium thickness then finished with sharp cheddar cheese and um… butter. Yea. Salt and pepper make this whole situation ideal. 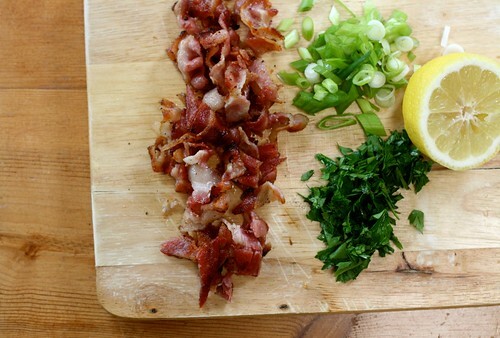 The cheesy grits get topped with bacon bits, shrimp, scallions, garlic and a splash of lemon to brighten the whole thing up. Good grief. Now that’s a meal. Spoon the grits into a serving bowl and top with shrimp mixture. Serve immediately. I made something similar to this on Sunday. Loved it, except unfortunately for me (not by choice) all my pots are non-stick and all my whisks are metal so I was left with lumpy polenta. 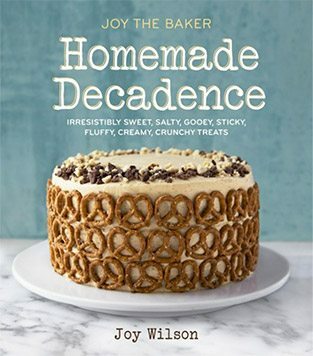 I’ve since added a silicone whisk to my amazon wish list (cheaper than new cookware). I have to admit, yours looks better than mine (I think it’s the bacon). Maybe one day my future husband will be as lucky as your future husband. I have never, ever had grits. I am so deprived. My husband would be so happy if I said anything like that. Haha that looks delicious. you are actually the cutest thing in the world! if i were a man and could deal with dating long distance i would totally be your husband. 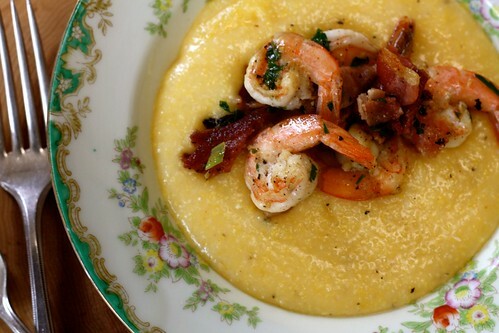 Oh wow – I was totally thinking that I might give grits a go – i mean they can’t be all bad if you pair it with shrimp… so then I was trying to think where would I find grits in Australia, then I read that it was Polenta! Awesome. I could still never bring myself to eat polenta for breakfast…. Also I totally need to send you some corny beer cozy’s from Australia! Althoguht we call them stubby holders or tinny holders. Yes stubby and tinny are words we call beer (so here the hubby would call out from the lounge “honey bring me a tinny will ya’). Tinny is the beer in the can and a stubby is a slightly more squat shapped bottle of beer. But it is a very ocker term, ocker is a slightly better word than Redneck…. more country bumpkim rather than wife basher…. There you go now you have learnt something too! 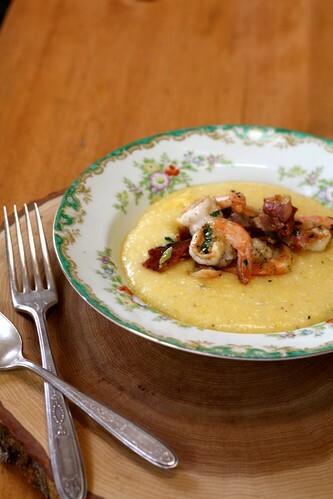 Lovely polenta con scampi, never heard of cheddar in it though, and I surely come from the land of polenta (NE Italy, near Venice), but maybe this is a good idea, I’ll try it. Usually husbands do appreciate a good cook, I already envy yours, he’ll be a lucky man! oops, I forgot to add that my mum cooks polenta with water and then adds a little milk. a-mazing. and ditto – i would totally be your husband, too. Oh Joy. That looks so YUM! Your future husband will be a lucky man! This is my favorite food in the WORLD! I can’t wait to make it! thanks for sharing, as always. Wow – I’m making sure that my current husband never reads your letters or he may be my ex and your future husband- shrimp, grits, beer, beer cozy… OK scratch that- Will you marry me? One lucky dude I’d say…this looks so yummmy!